It’s a European week in Leinster headquarters but November and Ireland continue to loom large. An insipid weekend of PRO14 action hasn’t removed the remnants of the international window and the ongoing ramifications of the Ireland coaching situation from the agenda, so when Rob Kearney sits down at the top of the room the focus soon turns to the national questions. Wearing neither green nor blue but black at Leinster headquarters yesterday, the full-back is a man with a foot in both camps. News that Joe Schmidt will give up coaching after the World Cup and that Andy Farrell will replace him doesn’t appear to have overly surprised the long-standing No 15 who yesterday revealed his intention to continue playing beyond the tournament in Japan. Having lived through the last transition that saw Schmidt leave Leinster for Ireland, a move that led to a dramatic upturn in fortunes for the national team but a lull for the province, he is wary of talk that Stuart Lancaster might join his former England colleague as attack coach in 2019. The Leinster senior coach is in demand with Saturday’s opponents Bath linked with a move for the man who has enjoyed a hugely successful stint in Dublin. Leinster hope he will commit to the province beyond the end of this season but Ireland come first in the pecking order here and if Farrell wants to reunite with his old boss it would be a difficult approach to refuse. “It’s a tough one,” Kearney said. “I’ve got two hats on: a green one and a blue one. “Stuart is an integral part of the province here, the team, how we play and the success we’ve had over the last couple of years. So, if he was to leave it would be a pretty big void to try and fill. The idea of a coach announcing his departure early hasn’t always gone well, but Kearney doesn’t believe it will be an issue in an Ireland set-up that is uber professional. Indeed, he believes Schmidt’s decision to “finish coaching” and not join a rival nation will help the smooth nature of the exit. “It won’t have any impact (on the next year),” Kearney said. “The fact he hasn’t taken up another coaching role; if anything when it comes to the World Cup (it is) not that guys don’t try their very hardest, but when they know the coach is leaving the game for the foreseeable future they really want to dig in and give every little bit. “Whereas, if he was going to another team your mindset might just change ever so slightly. “I think it’s a natural progression for Andy, isn’t it? They’ve done their business pretty well. They obviously had this contingency plan in the background for the last six months or so. Nor does he believe having the successor alongside the departing man will have much of a material impact. “When we’re on the training ground, you don’t do more because Joe’s watching, then take your foot off when he turns his back,” he said with a smile. Speaking of assistants, this week will see Kearney and Leinster pitting their wits against his former coach Girvan Dempsey who is now at Bath, who host the champions at the Rec on Saturday. The former Ireland and Leinster No 15 left his home province for a new challenge in England at the end of last season and his successor in the shirt has plenty of respect for a man who mentored him in the early stages of his glittering career. “He was the one person who definitely took me under his wing starting off,” Kearney said. “I came in on the wing a little bit but I always knew that I wanted to be a full-back. I always think that it was a very selfless act from him to take the new young up and coming kid at the time. 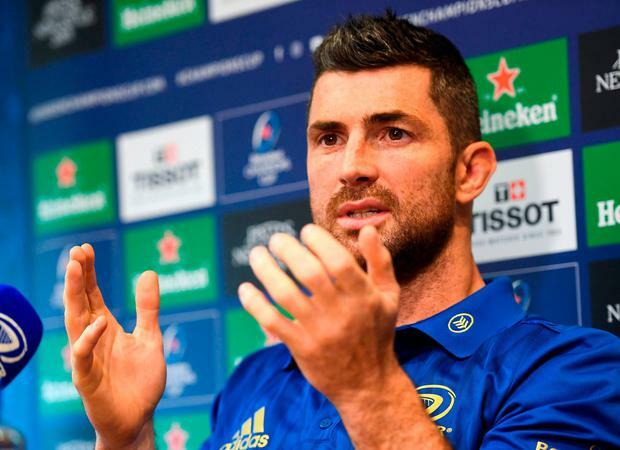 Dempsey was perceived as a conservative full-back but Kearney said he encouraged Leinster to attack when he took up his role as coach. “When you are attack coach, especially with the group that we have here, and probably in Bath to an extent as well, you want to showcase a little bit more,” he said. “He was always on for us having good cuts off defences.